Kumari (referred to as the living goddess of Hindus in Nepal) is the virgin aspect of Goddess Durga, worshipped in the form of a living being. This is an age-old practice. Generally, a girl who has not attained puberty is referred as Kumari in India and Nepal. The Kumari Temple is an important Nepali tradition. Now many people have started questioning the tradition too. The practice of Kumari worship has largely disappeared from other Hindu cultures especially in India. It is now limited to the eighth and ninth day of Navratri worship. Here young girls are invited to the home, worshipped, given presents and food. 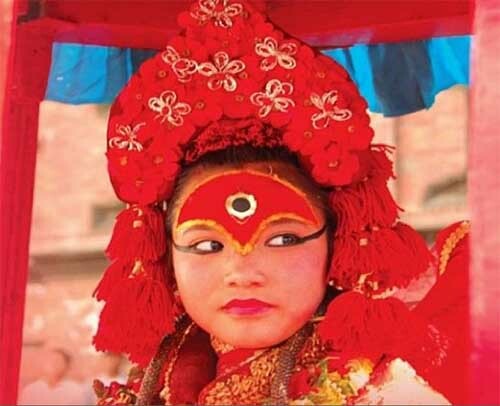 The practice of worshipping living Goddess is still in existence in the Kathmandu Valley in Nepal. In Nepali tradition, Kumari concept is a fusion of Buddhism and Hinduism. The girl at many times belongs to the Buddhist community. In Kathmandu, the chief of the Kumaris, Raj Kumari dwells in her shrine in the famous darbar square. She is chosen from the Shakya family of the Buddhist Newar community. Her attendants are from both Hindu and Buddhist sects. A kumari is normally chosen at the age of three or four. She should be physically fit and there should be 32 signs of beauty on her body. As it is very hard to find a girl as mentioned in the scriptures, leniency is shown in selection. Only death or some calamity can remove her from her post. Otherwise, she continues till puberty. On attaining puberty, Raj Kumari is replaced by a chosen successor. Kumari has a very influential position in the socio-religious life of Hindus in the Kathmandu region. She has received royal patronage from the medieval period. The origin of Kumari tradition is associated with Goddess Taleju. She appeared in the kingdom of Nepal in the form of a beautiful woman. The king of the region welcomed the beautiful woman as the astrologers in the kingdom identified her as a Goddess. The king was overwhelmed by the beauty of the Goddess and attempted to outrage her modesty. Goddess Taleju immediately left the region and along with her went away the prosperity of the region. There was death and drought in the region. The king felt remorseful at his behavior and offered prayers for several days. He begged her to come back. Finally, Goddess Taleju relented seeing the pitiful condition of living beings in the region. She asked the king to treat a girl who has not yet menstruated as her alter ego. The presence of the Goddess will be felt in the Kumari. When the king performed the rituals, prosperity returned to the region. The selection process of Kumari is believed to have started from the 10th century AD. The process is tough and very picky. She is selected by a committee comprising of priests and officials. First aspect is the origin of the young girl. Then there is a serious of physical and mental verifications. Once selected the girl lives a secluded life confined to a temple. She does not show herself in public daily. She appears only during important Hindu festivals like Dashain (September – October). There is a popular belief that if you catch Kumari’s eye you will become lucky. She is a symbol of auspiciousness and luck. Why People Are Now Questioning the Kumari Tradition? Secluded life for a young girl. Her childhood is robbed in the name of tradition. She loses all her childhood. She lives in a golden prison. After attaining puberty, the girl is sent back to the family and she suddenly loses all her glory and importance. This causes depression and mental problems. It is considered bad luck for a man to marry a former Kumari. So many of them remain unmarried.